One of the best ways to start reducing your energy usage is to track exactly how much electricity you use using a plug-in power meter or wireless energy monitor. When you can see exactly where electricity is being used, it is much easier to understand how you can reduce your consumption. Unfortunately domestic energy monitors which can be connected to a computer (and the internet) so that data collected can be plotted on graphs, processed, and analysed are few and far between – the Wattson Energy Meter being a notable (but expensive) exception. Therefore, if you would like to track in great detail your energy consumption you will need to use your ingenuity and DIY skills! There is no better resource on the internet for anyone interested in advanced home energy tracking than Bwired – a home automation showcase. On this inspirational website vast amounts of information is provided on monitoring, analysing, and presenting electricity, gas, and water usage data. In this automated home located in The Netherlands, the electricity meter, gas meter, and water meter are all monitored using small sensors connected to an RFXMeter – a device which counts and stores incoming pulses from the sensors. It then transmits the collected data at frequent intervals to an RFX receiver (wirelessly). This receiver is connected to a computer where the data is added to a database for analysis and presentation. Individual electrical appliances such as the fridge, dishwasher, television etc are all plugged into Plugwise system sockets. These sockets track energy consumption much like a standard plug-in energy monitor, but they can also be controlled remotely (and automatically) and transmit electricity consumption readings in real time. This enables phantom loads (devices left on standby etc) to be identified quickly and turned off, and usage patterns to be analysed. Click here to visit the Plugwise website. For those interested in reducing the amount of water used when they flush their toilets, wireless sensors have even been fitted to the dual flush toilet so that its usage can be tracked. 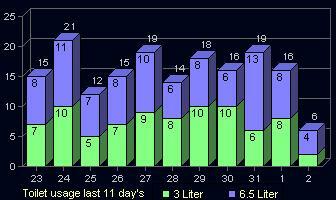 The collected data is shown graphed above. See our articles Save Water When Flushing Toilet and Flush Toilet with Rainwater for more information. The Bwired website is found here, and the Bwired Forum is here. Both come highly recommended.